UPDATE: NEWS Agency Reuters has reported a tenth boy has been rescued from the Thai cave where he and his teammates have been stuck for more than two weeks. The rescue is expected to happen rapidly tonight as experts try to get the remaining boys and their coach out of the cave system. Reuters reported a witness saw the tenth boy carried out on a stretcher. Police and navy sources confirmed the rescue to news agency AFP. A ninth boy was confirmed rescued less than two hours ago. Eight of their teammates have been rescued over the past two days and are now recovering from their ordeal in hospital. Along with the boys and their coach, the specialist rescuers will also need to leave the cave during tonight's rescue operation. UPDATE: A NINTH boy has emerged from the Thai caves. It comes amid a third, and likely final, rescue mission to save a young soccer team that has spent more than two weeks trapped underground. The boy is thought to have come to the surface at around 3.30pm local time (6.30pm AEST) but there has been no official confirmation. Thai authorities have been reluctant to confirm any rescues until the end of each day but a flurry of ambulances and helicopters has tended to be a giveaway. News agency Reuters has said the boy was carried out from the cave on a stretcher. The rescue means three boys from the Wild Boars soccer team and their coach are still within the Tham Luang Nang Non cave complex in the country's far north. BREAKING; We are hearing unconfirmed reports that the ninth boy has just come out of the #thamluangcave. Nine down. Four more to go in this extraordinary rescue mission. Authorities are desperate to get the mission done on Tuesday with officials on the ground reportedly saying it is now a "race against time" as the weather worsens. The BBC's Jonathan Head said the incessant rain had focused minds: "The team of Thai and foreign divers has gone back in to try to bring out the last four boys and their coach, in what one person involved in the operation described as a race against time - the rain is likely to increase water levels in the cave system." At 10.08am local time (1.08pm AEST) 19 divers headed back into the tunnels. "We expect that everybody will be out today, the children and coach and everybody will be out today," said mission commander and Governor of Chiang Rai province Narongsak Osottanakorn on Tuesday afternoon. Applause is said to have rung out at the press centre when officials announced the mission was underway. However, Mr Narongsak sounded a note of caution telling reporters that the third mission was more perilous than the previous two. On Sunday and Monday the teams only had to pull out four people in each push. On Tuesday, five people need to be rescued along with a doctor and three Navy SEALs. "Please give us time to work. Today's mission is more demanding than the two previous days." he said, warning it could be a longer wait. EARLIER: FOUR more boys have been rescued from the Thai cave after Monday night's rapid-fire operation, bringing the total rescued to eight. But the head of the rescue operation would not confirm whether all five would come out on Tuesday night, raising questions over whether coach Ekkapol Chantawong could be left behind. Narongsak Osottanakorn said in a press conference after Monday's rescue that it will be up to the divers to decide whether it is possible to save all five. He warned that "the plan is designed for rescuing four" and "for safety, the best number is four". The former governor of Chiang Rai province said he hoped for "100 per cent success" when the rescue resumes, with the mission again suspended for up to 20 hours. The eight boys who have been rescued are "safe and conscious" in hospital, said Mr Narongsak. They were placed in isolation as a precaution, although he said the authorities may soon allow the parents to see the boys. Local officials refused to confirm the identities of those who had been rescued, and their parents have not been informed of who is out. The families have agreed to remain at the cave until all of the boys and the coach are saved. UPDATE 11pm: CHEERS were heard outside the cave complex in Thailand with reports four more boys have successfully made the dangerous journey from inside the mountain to the surface, bringing the total rescued to eight. The boys emerged from Tham Luang cave system over a period of just a few hours, with the final two making it to safety within minutes of one another at around 10pm Sydney time. A team of 12 young footballers and their coach were trapped in a dark, flooded chamber on June 23 and have been imprisoned for more than two weeks in Chiang Rai province, in the country's mountainous north. Four boys were extracted on Sunday and four on Monday, and the eight were evacuated to hospital. That leaves just four boys and their 25-year-old coach deep within the tunnels. With the rescues occurring four at a time, operations at the cave are winding down for the evening. The fifth boy blinked into daylight at around 4.30pm (7.30pm AEST), with the sixth at around 6pm local time (9pm AEST) and the seventh and eighth in quick succession at 7pm (10pm AEST). Authorities have yet to comment on the rescues on Monday and have not confirmed any of the freed children's names. Nonetheless, those leading the effort have become increasingly upbeat and said the remaining rescues could happen faster than expected. Media were told to expect "good news". On Monday evening, news service Reuters reported rescue workers had carried a person on a stretcher away from the cave complex and into a waiting ambulance, according to a witness. He was the first boy to come out of the cave on the second day of the rescue mission to retrieve the group trapped in the flooded cave after apparently entering for an initiation rite. The ambulance drove toward a helipad, from where a helicopter took off shortly after to cheers from a crowd, AP reported. The same process was used on Sunday for at least one of the four boys rescued in the first operation. After a brief rest, the same divers who brought the first four boys to safety went in again. UPDATE 7pm: AN OPERATION to rescue the remaining nine people trapped in a flooded Thai cave system is in full swing as the same divers who brought the first four boys to safety go in again. At a press conference on Monday afternoon, Narongsak Osattanakorn, Governor of Chiang Rai province and the head of the joint command centre co-ordinating the operation, said rescue teams re-entered the cave system at 11am local time on Monday (2pm Sydney time). Despite the many challenges ahead, and the death of one diver days ago, he struck an upbeat note: "I expect in the next hours we will have good news." Mr Osottanakorn said some of the boys could emerge around 10.30pm AEST. The boys most up to the challenge of diving in the murky waters would be the next to be retrieved. He said the "water level is not worrisome" even though heavy rains have fallen on the Tham Luang cave system in the country's north. 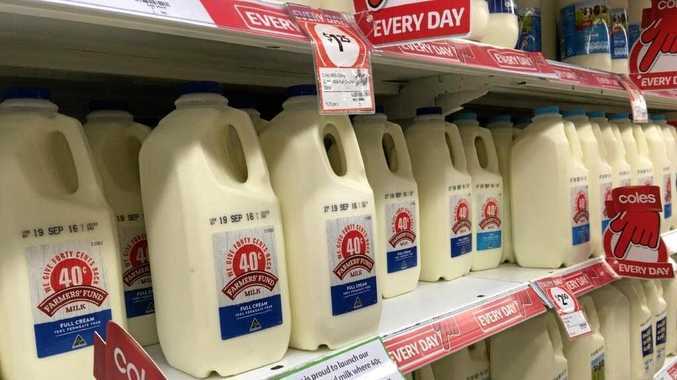 Thai authorities have also revealed what food the rescued boys craved most once they emerged. Mr Osattanakorn said the rescued boys were in good spirits. They were hungry this morning and had requested pad kra pao - a popular dish of spicy basil chicken with rice. But with the four being kept in isolation, they still won't be able to embrace their parents - the closest they will get is a wave through a glass screen. "We are considering to let the parents see the boys. Perhaps visiting him outside the (transparent) glass room," Mr Osottanakorn was reported as saying. The perilous journey to rescue the remaining nine could be even more dangerous the second time around, with rescuers today waking to gloomy skies as another thunderstorm looms, following a night of heavy monsoonal rains lashing the mountainous region. There are concerns that rising floodwaters in the cave complex will complicate rescue efforts and affect the evacuation. Officials have said storms forecast for Chiang Rai province in Thailand's far north had factored into their decision to go ahead with a complicated and dangerous plan for the boys aged between 11 and 16 and their coach to dive out of the cave. Four of the boys were rescued on Sunday, but nine remain underground including their 25-year-old soccer coach, Ekkapol Chantawong. The second leg of the risky operation was placed on hold overnight as air canisters were today replenished along the underwater route to where the boys and their coach have been trapped for almost two weeks. Thailand's Interior Minister Anupong Paojinda revealed the same divers who rescued the four boys were conducting subsequent operations because of their knowledge of the terrain. The announcement came after officials met Monday morning to discuss how to get the remaining nine people out of the cave. "The fact that it took so many hours underscores how precarious this whole mission is," she said. It's unlikely the nine in the cave are aware their teammates were rescued successfully, due to a lack of communication tools between them and the entrance, according to Ten News reporter Daniel Sutton. Experts say it's crucial for their survival that the remaining boys are told of the positive news. 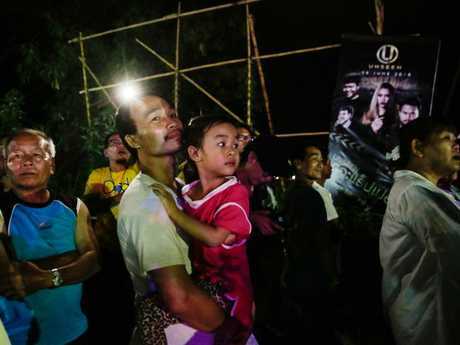 Thai governor Narongsak Osottanakorn described the first rescue as "our masterpiece work" and claimed the four rescued boys were in "perfect" health - despite earlier reports that one was being "closely monitored". Upon exiting the cave, they were evacuated by helicopter and ambulance to hospital in Chiang Rai province, where they remain. According to CNN, the boys will spend a day or two in isolation, inside a sterilised isolation unit, as a health precaution. This means they'll have no physical contact with their parents until the isolation period is over. Authorities have so far refused to release the identities or conditions of the four who have escaped. "Don't ask these kinds of questions. Not wise questions to ask," Prime Minister Prayut Chan-O-Cha told reporters in Bangkok on Monday morning when asked about the conditions of the four. EARLIER: FOUR of the boys who were trapped in a flooded Thai cave system for two weeks have made it to safety after a perilous journey, but nine people remain underground. The first two emerged from Tham Luang cave in northern Thailand at 5.40pm and 5.50pm Sunday local time (8.40pm and 8.50pm AEST), less than eight hours after the rescue began at 10am. The third and fourth boy came out at 7.40pm and 7.50pm. The divers hugged the young soccer players after helping them escape the dank, dark cave complex. The boys received treatment at the scene before they were evacuated to hospital in Chiang Rai province by ambulance and helicopter. Officials said on Sunday night that the extraordinary operation would now pause for ten to 20 hours to assess next steps, check equipment and refill oxygen tanks stationed along the dangerous route. 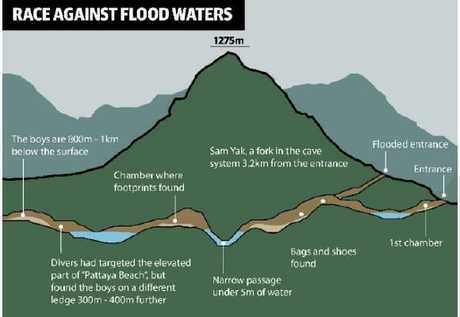 The first boy to emerge was named by local media as Mongkol Boonpium, 13, and the second as Prachuck Sutham, 14, but Chiang Rai governor Narongsak Osattanakorn would not confirm who had been rescued. He said a doctor had determined the order of evacuations, with the strongest leaving first. The 12 schoolboys, aged 11 to 16, were trapped in the cave by floodwaters on June 23, after apparently entering to scratch their names on a cave wall as part of an initiation rite. Divers hugged the boys who were then evacuated to hospital in the Chiang rai province by ambulance and helicopter. 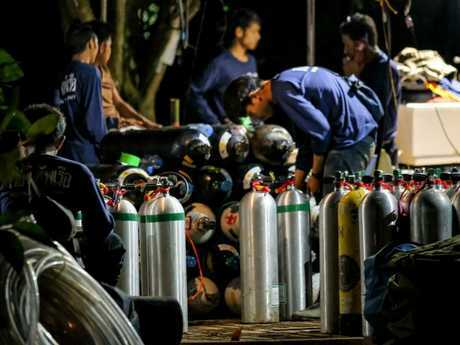 The massive and so-far miraculous operation, involving 50 foreign and 40 Thai divers, saw the four children able to walk unassisted from the sprawling cave complex, ahead of schedule and in good spirits. "Today we rescued four children and sent them to hospital," said Governor Narongsak Osotthanakorn, tasked with overseeing the mission. "We saw the children's faces today - it is the perfect day, the best situation. The operation went much better than expected." Gov. Osotthanakorn confirmed the healthiest boys had been taken out first and that the operation would now pause and not start again for another 10-20 hours while equipment was rechecked and oxygen tanks refilled. Just after 9pm (12am AEST), Thai navy SEALs posted on their Facebook page again, saying: "Have sweet dreams everyone. Good night. Hooyah." Gov. Osotthanakorn had earlier asked the world for its prayers so the 12 boys and their coach could be delivered safely. "We expected the first child to come out at 9pm (12am AEST) but everything went well, with the first child coming out at 5.40pm (8.40 AEST) and the second child 10 to 20 minutes later," he said. The second pair of boys followed two hours later. The remaining eight boys and the soccer coach are either at "chamber 9", where they have been stranded for much of the past 16 days, or moving forward to new positions in the cave. "Today was the best situation in terms of kids' health, water and our rescue readiness," said Mr Narongsak in a press conference on Sunday evening. But he warned the dangerous rescue was far from over. "Our job is not completely done. We will have to do the next mission as successfully as the one we did today. The rest of the kids are in the same spot. The mission to free the 12 boys and their coach from the cave is underway. "Air tanks and systems have to be put in place again." He said the rescue would resume between 7am and 5pm (11am and 9pm AEST). "I have to check all factors are stable. The operation then will be carried out." He said the four boys were in "perfect" health - despite earlier reports that one was being "closely monitored" - calling the rescue "our masterpiece work". Major General Chalongchai Chaiyakam said the extraction could take another two to four days, depending on conditions. Rescuers smiled but did not cheer or clap as the boys emerged, their mood still "subdued" as they wait for the rest, a source at the cave entrance told Ten News reporter Daniel Sutton after media were moved back. More than 90 international divers and 40 Thai divers have taken part in the daring rescue. Thirteen divers entered the cave at 10am Sunday local time (1pm AEST) - some heading straight for the trapped group and others taking up stations along the three-kilometre system of flooded chambers. Each boy was to be accompanied by two divers. The boys were given full scuba masks, strapped to a "buddy" diver by a tether and dragged along. The divers were to carry two tanks and provide the boys with oxygen as they passed through the cold, muddy water and airless chambers that have already claimed one life. Ten rescue divers headed to the boys in chamber nine, and to the junction at chamber six. Another three began support work at 2pm (5pm AEST). Adelaide anaesthetist and diving expert Dr Richard Harris also joined the Thai navy. The hardest part of the mission was expected to be a 200m submerged dive. At one point, they would be confronted with the narrowest gap in the cave system - a 38cm hole in the rocks they would have to squeeze through. Water levels inside the cave are fluctuating, making it difficult to know for sure how long some of the dives will take. Before the Thai rescuers went in, they posted a message on the navy's Facebook page: "We, the THAI Navy SEALS, along with the international diver team, are ready to bring the soccer team home." The boys - cold, malnourished and exhausted - have spent recent days preparing to swim through the underground maze and squeeze through the narrow choke points. The rescue had been on hold with several suffering from exhaustion and others unable to swim, let alone dive, but the arrival of monsoon rains made it essential to begin. The timing of the deluge could not have been worse. The mountain range above the cave, previously visible from a distance, was covered in storm clouds and impossible to see by 3.30pm. It is now officially a race against time. Rescuers had been frantically trying to pump water out of the cave, but the assisting British Cave Rescue Council said they had "run out of time" for this option as "rain will reverse the remarkable progress made over the last few days." At a press conference on Sunday morning, Mr Narongsak said the boys were aware of efforts being made to rescue them but the extraction would be long and incredibly dangerous. "Now the 13, their health and their minds are ready and they all have knowledge of the mission. They're ready to go out," he said. "Today is D-Day." The forecast for continuing monsoonal rains and dropping oxygen levels in the cave meant the situation had become more urgent over the past 24 hours. Shortly before the rescue operation got underway, Mr Narongsak said the health of most of the boys had "improved to normal", and that divers were continuing to teach diving and breathing techniques. How quickly the boys are moved out will depend on the conditions and water levels inside the cave, which are likely to rise with the rain. Operations "may stop and start depending on conditions," Mr Narongsak said. "They can't take them all out at once for fear of a dangerous bottleneck situation," said CNN's Matt Rivers, who is on the scene. He noted green netting and barricades had been erected outside the cave entrance and around a dozen additional ambulances brought in as the rescue attempt became imminent. Journalists were asked to leave the site on Sunday morning for a new media centre set up 3km away so a rescue operation could take place. ABC news director Gavin Morris stressed the urgency of the situation amid ominous weather reports. "The weather has clearly turned. The world is looking on anxiously," he tweeted. Mr Narongsak said officials are "still at war with water and time", after experts warned him that rain could shrink the dry ledge where the boys are sheltering to just 10 square metres. "All the plans must not have any holes in them," he said, noting that "hundreds of people have vetted this" and "there will always be margins for error." He said floodwaters had been drained as much as possible, but the rain could increase the risk. "The plan that I've held on to from the beginning is that we have to bring the kids out and the determining factor of this plan is to have as little water as possible." He also warned of higher carbon dioxide levels in the cave. As the divers went in, it emerged that not all families had given their blessing or consent for the rescue mission to go ahead. Mr Narongsak said "they know, they understand", according to Ten News reporter Daniel Sutton. Various extraction methods have been proposed by experts and even Tesla boss Elon Musk, including drilling or placing the boys in nylon pods with air tanks. With time against the rescue team as the downpour began, they were ruled out and the original plan to swim out was decided upon as the best option. Rescuers had attempted to dig more than 100 holes, with 18 of them looking promising. But Mr Narongsak said he was not sure they could reach the boys, with the deepest reaching only 400m below the surface and the group trapped more than 600m down. "The suggested 'escape pipes' could not be made sufficiently small, flexible and strong enough to withstand the passage of the children and rescuers, nor the abrasion from the sharp rock and strong currents inside the cave," added the BCRC in a statement on Facebook. "Sitting out the monsoon on a small, crumbling ledge with reduced oxygen and the risk of it severely flooding during the monsoon rains is no longer considered to be a viable option. "This seems to leave the diving option as the least risky of these many uncertain options." Australian drilling expert Kelvin Brown, who was part of the 2010 rescue of 33 Chilean miners trapped 700m below ground, told the ABC drilling could be useful, but the situation could be different. "We knew what the formation was, we knew if there were faulted zones, the presence of aquifer," Mr Brown said. "I'm not too sure all that information is actually at hand in this Thai scenario. But it's all possible, as was proven. "It makes a bit more sense to me anyway, at least for the sake of safe access, to use a drill hole." The 12 boys play in a local soccer team called "Wild Boars". They were led into the partially flooded cave by their coach before a sudden downpour trapped them and were not heard from for more than a week. "To the parents of all the kids, right now the kids are all fine, the crew are taking good care," Ekapol Chanthawong wrote. "I promise I will care for the kids as best as possible. I want to say thanks for all the support and I want to apologise to the parents." "I want to eat pan-fried pork," one of the boys wrote. "Don't worry, everyone is strong", one letter read. "When we get out of here, we want to eat many things. We want to go home as soon as possible." The death of military diver Saman Kunan on Friday underscored the huge risks the boys face. Saman was part of a team trying to establish an airline to the chamber where the children were awaiting rescue. He had placed oxygen tanks along the route but didn't have enough air to get back to safety. The diver's death brought heartache for rescuers and anxious relatives waiting outside the Tham Luang cave in the country's mountainous north - and raised serious doubts over the feasibility of attempting to bring a group of boys with no diving experience out through the cramped passageways. 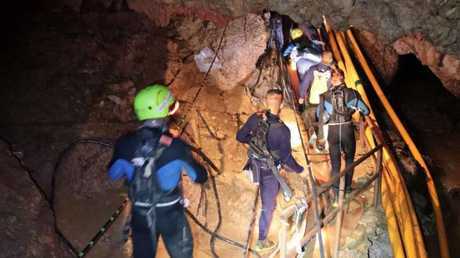 Thailand's Navy SEAL commander on Friday said rescuers might have little choice but to attempt the tricky extraction of the group, the first official admission that the 12 boys and their coach might not be able to wait out the monsoon underground.